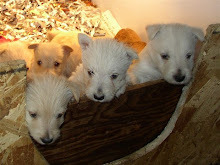 Montgomerie of Camas - AKC Scottish Terriers: Puppies coming! We have two of our dams getting ready to give birth! Roxie (with Charlie) and Lizzy (with Stewie) are both pregnant. They should be having late Feb. or early March deliveries. Our prices have not changed since 2004! ...or click here to download a sales contract.